a ska loving geek: i scrapped! 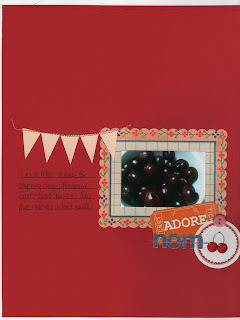 yay me :) i picked up my scrap'a'gogo kit from the post office today and my cherry photo was perfect. im sorry it isnt very clear but im having to scan LOs in, which doesnt work well if there's any extra dimension. i also think my old sewing machine has properly died now. Extra tags from shabby chic crafts. Beautiful layout and I also think glace cherries are just wrong!